traditionally, forests have been viewed as public goods, subjected to the tragedy of commons, as incentives to a "free ride" are enormous. However, Hardin's idea that there are only two sustainable policies either the commons should be privatised or it should be brought under the control of the government is no more the popular perception. For more than a century now, it has been argued that a proper regime of property rights involving the politically and economically marginalised population, who survive on forest produce, is essential to save the forests from becoming openly accessible. Historically we have had communally-shared norms and a system of self-control when it came to community resources. A lot of literature on this issue is already available. However, The Saga of Participatory Forest Management in India is not just another book on forests. It is an excellent review of the existing literature and issues therewith. Those involved with sustainable forest management and policies would find the book to be of immense help. The author begins by tracing the government policies till 1988. This was the time when a new, radically different forest policy was announced and the focus shifted from revenue generation and commercial feasibility to environmental stability and strengthening tribal-forest links. The book also touches upon aspects of social forestry and fringe area development, which the government experimented with to stop deforestation. These aspects are important in view of the fact that if resources outside forest land become more productive, infringement on forests will decrease. 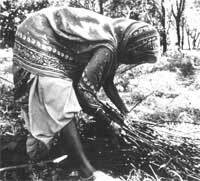 However, there is a distinction between the use of fuelwood by rural folk, which is potentially sustainable, and the urban sector needs. The author then goes on to trace the emergence of Joint Forest Management (jfm) . Sustainable management of forests would entail getting both property rights and product prices correct. The author deals with the first issue at length. The challenge of getting property rights correct is essentially of developing effective institutions, legally empowered to manage common natural resources. This is no easy task. The author presents a lucid picture of the complex political, socioeconomic, administrative and legal issues involved in the process of institutionalisation. This is undoubtedly the strength of the book. People's institution can be of two types one which has full control over the management of the forests and the other with state committees overseeing the management. The former advocates Communal Property Rights while the latter entails jfm . The author promotes the latter. However, villages like Sukhomajri and Ralegan Siddhi are testimony to the success of communal property. The success can largely be attributed to homogenous caste composition and exceptional leaders. The author regards both these options as rare and concludes that such experiments are generally non-replicable. However, he admits that at various places complex problems involves participatory management and composition of forests and its variation from state to state. At the macro level, the role of incentives should be understood and incorporated without which participatory management will remain a half-hearted and short-term exercise. The legal structure also needs to be well-defined. Various aspects needs to elucidated for instance, the relationship between forest protection groups and panchayats. Panchayats are political organisations based on the electoral system but the "powers of the Forest Protection Committees are not given under any law which might affect their ability to check free-riding in the long run." Essentially, the rights should not disturb the "care and share philosophy", which is the basis of jfm . The other crucial aspect is transparency and clarity about "who would get what and when". Awareness is extremely low. Here, the non-governmental organisations can play a crucial role in enhancing community participation. However, such efforts need to be supplemented by income-generating programmes. The author advocates cautious optimism and stresses that " jfm should not be seen as a panacea for forest degradation". Whatever be the outcome of the experiments, the relevant issues and trade-offs should be considered. Only this can pave the way towards evolving effective institutions. jfm spells out the conditions necessary for tackling land degradation. It requires a paradigm shift and "will be successful only when radical changes are introduced in rights and privileges over forests, policies and laws..." consistent with the 1988 objectives.